Now that you are here, I am sure you either ought to learn more about marine batteries or looking forward to buying one. It’s somewhat very difficult to select a particular boat battery as there are countless choices in the competition. This is the primary reason according to me, why many buyers find it confusing. But don’t worry; I’m here to help you select the most appropriate marine battery, as per your need. In this page, you’ll not only find honest reviews on numerous marine battery models, but also I’ll provide you valuable information about batteries. Through this website, I look forward to giving you not only the list of top 10 best marine batteries but also save your research time by providing some basic knowledge about marine batteries. I have always tried to keep my contexts brief and straight to the point. But still, some of you might not have that much time to go through all of it. Keeping this in mind, I have created an organized Comparison Table that consists of short overviews of the best marine batteries, comparing them on the basis of their performance, type, and a few notable features. In case you have time for some more research, please feel free to go through each review. If you are a marine enthusiast, a marine battery is a must have accessory for you. It’s the sole mode of power storage and backup, not only for your boat, but also to run the various appliances onboard. For the best recreation and fishing experience, having the right marine battery is really important. The most important factor that you must consider is the purpose of the battery. First make sure whether you require a battery only for cranking the boat or running onboard appliances or both. 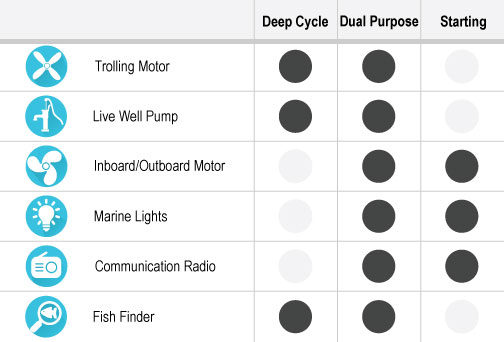 According to your need you can select between Cranking (Starting), Deep Cycle and Dual-purpose marine battery. Cold Cranking amps or CCA is used in determining the starting suitability. It’s the number of amps delivered at 0°F in 30 seconds in order to maintain voltage above 7.2 volts, which is the least power needed to crank an engine. In a marine battery, it’s referred to MCA or marine cranking amps, which is determined as the number of amps delivered at 32°F at 30 seconds. If you need to start your boat during cold season, go for a battery that has at least 500 CCA rating or more. It’s best to choose a battery that has equal to or more MCA rating than the recommended unit for your engine. Also, if you are buying a deep cycle battery, you must consider the RC or Reserve Capacity rating. It indicates the number of minutes a battery can sustain a load of 25 amps at 80°F until it’s discharged to 10.5 volts. For example, a battery with 150 minutes RC rating can last for 2 and half hours by operating a load of 25 amps. Select the battery depending on the liabilities. In a deep cycle marine battery, the Amp Hour rating is another important factor. It implies the number of amps a battery can deliver in a time period of 20 hours. For example, a battery with 100 AH will deliver 5 amps per hour for 20 hours. It’s not necessary that a 100 AH will fully deliver 100 amps, so always choose the battery that has more amp hour rating than the actual amount required by you. Marine batteries come in different sizes. They are determined in groups; for example, 24, 27, 31, 6D, 8D, etc. If you already have an old battery box, make sure that the battery you purchase perfectly fits in the box. Also, keep in mind the ventilation system available in your boat. Don’t go for large battery if you lack room. Can be mounted in numerous positions. Maintenance-free, as they don’t need any kind of refilling. Only some time-to-time cleanups are necessary. Most of them are vibration and shock resistant. More durable than other standard lead acid batteries. Special Functions: There are batteries that can be mounted in any position and also some high-end batteries are water-proof, and can be inverted upside down. These features can be very useful for the marine field.Some deep cycle batteries come with thicker plates so that they can tolerate deeper cycles. Manufacturing date of the battery can’t be ignored. It’s very important to cross check the date of manufacture before buying the unit. Just like other ratings, the MFD is also labeled on the battery. Always go for the ones that are fresh. Never buy a battery which has MFD of more than 6 months from the day of purchase. 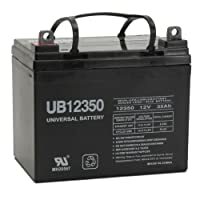 The Universal UB12350 battery is a powerful 12 volts sealed lead acid battery with capacity of 35AH. It’s the cheapest and most affordable deep cycle battery available in the competition. UB12350 works right when you need it to. This deep cycle marine battery is one of the most powerful, reliable and durable 12V batteries. It comes with many exceptions like thicker plates, corrosion resistant terminals and optimal performance ability. Most importantly, this unit is quite small in size and light in weight, also making it one of the most portable marine batteries. 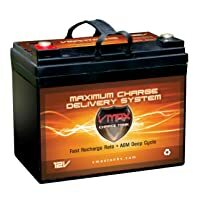 The Vmax857 battery from VMAXTANKS is a 12 Volts AGM battery with 35AH capacity. It’s best known for its quality, performance and structure. The physical and chemical structure of the plates is unique, and has been processed through special treatment, making this unit extraordinarily reliable, strong and outstanding performer, which is far better than the marine batteries with standard Pb_Ca plates. It belongs to group U1. Vmax857 is also resistant to shock and vibration. It’s light in weight and profoundly portable. If you are looking for a deep cycle marine battery with highest quality and reliability in this class, then Vmax857 is your ultimate choice. If you need a cranking marine battery with CCA more than 1000, then you can consider buying Odyssey 31-PC2150S. It’s designed for heavy duty and commercial fields. With capacity of 100AH, it’s one of the best marine batteries under group 31. 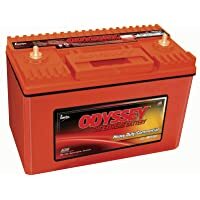 Odyssey 31-PC2150S is made of AGM technology and hence it’s considered one among the non-spill batteries with features like shock and vibration resistance. This battery is capable of delivering massive cranking power and rapid recovery that your commercial vehicle demands. Also, with pure lead plates, it’s 3 times more powerful and durable than any standard battery. Optima 8006-006 is a 12 Volts battery with AGM technology and ultra-high performing spiral-cell feature. The unit is a fully maintenance free package due to its stainless steel stud post, and has outstanding cranking power. This battery has unique structure, which makes it 15 times more vibration resistant and durable than the standard lead acid batteries. It has a very low internal resistance, offering higher efficiency of power output and faster recharges. In case you want a powerful group 34M marine battery with 800 CCA, then Optima Batteries 8006-006is perfect for your boat. 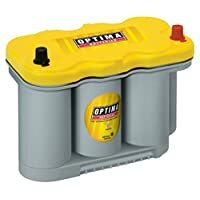 You won’t find any other unit better than Optima 8037-127 YellowTop, if you are looking for a good cranking marine battery belonging to group 27. It’s a 12 Volts AGM battery with 66AH capacity. Like other Optima batteries, this unit also has the Ultra-high performing spiral-cell technology. It has cycling capability that is 3 times more than the standard cranking batteries of same category. 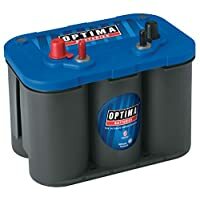 Most importantly, Optima 8037-127 can also be used as a deep cycle battery if necessary. 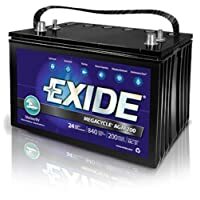 For those marine enthusiasts looking for a group 31 dual-purpose AGM marine battery with 100AH capacity, Exide XMC-31 is an excellent choice. This storage unit comes with all the advanced features that a professional can seek for. With 1110 starting power and deep cycling power twice the standard batteries, it’s one of the most demanded marine batteries in the competition. Also, it’s maintenance-free and 4.5 times more vibration resistant than other units when used in heavy duty fields. 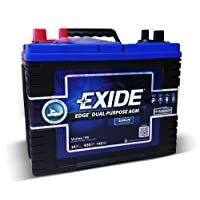 Exide Edge FP-AGM24DP is a cutting-edge 12 Volts dual-purpose marine battery, featuring an advanced graphite technology. If you require a group 24 battery, then this is exactly what you need. AGM technology makes the battery highly reliable and quite durable. With Exide Edge FP-AGM24DP you need not worry about your vehicle being damaged due to battery failure as this unit only makes it strong and newer. It’s known for its superior and unique construction, that makes it last longer than other units of the same category.For protection, I would recommend NOCO HM300BKS battery box. 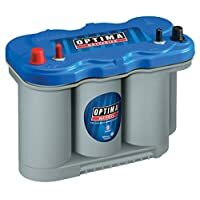 Optima 8027-127 BlueTop is the superior 12 Volts dual-purpose battery of group 27. Featuring AGM technology with exceptionally high performing spiral-cell technology, this battery has all the advanced composition. It has both optimum cranking power and deep cycle ability, and can take 3 times more recharges than other standard lead acid batteries of the same category. 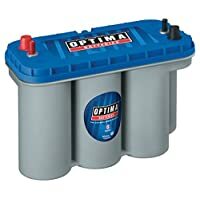 Optima Batteries 8027-127 BlueTop has excellent durability as well. It’s 15 times more vibration resistant and completely spill-proof. The best part is that this battery can be virtually mounted in any position.Optima Digital 400 is an ideal charging option for this battery. 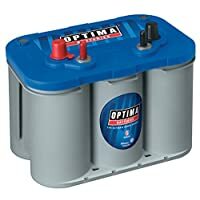 Optima 8016-103 is the best dual-purpose battery in group 34. It’s a 12 Volts AGM battery with 50AH capacity, and perfect for multiple high-power demanding accessories. With optimal starting power and deep cycling capability that is 3 times more than the standard batteries, it’s the ultimate choice for the marine enthusiasts looking for a powerful marine battery in this category. Optima 8052-161 is affordable and profoundly reliable, and the best in its class. This 12 Volts dual-purpose AGM battery belongs to group 31, and has optimal quality and performance. It has exceptional cranking power and deep-cycling ability that is trice the capacity of any standard lead acid battery of the same category. With CCA rating of more than 1000 and capacity of 75A, it’s perfect for your heavy load demanding appliances or commercial boat engine. A marine battery is a very important unit for those marine enthusiasts and professionals. It is a mode of direct or backup power for a boat or other marine units. Having a battery that runs all the onboard appliances makes the recreational boating and fishing more pleasant. Choosing a new marine battery for the boat can be a very challenging task, especially for those inexperienced buyers as there are varieties of marine batteries with different applications, chemistry, advantages and disadvantages. One must be very careful and specific while choosing a particular marine battery and select one depending on the requirements. This complete buying guide should help you in choosing the right marine battery. Weight is a very important factor that you must consider in marine batteries. It’s obvious that you are going to move the battery in and out of the boat often, so choose the battery with average weight. In case you need to transport the unit quite regularly, then a marine battery with weight of 20 to 50 pounds is an ideal choice. However, a battery weighing around 70 to 80 pounds will do if you don’t need to transport often. As boats operate on motor, the battery is exposed to tremendous amount of vibrations constantly. Vibration is the primary cause behind the damages done in the internal parts of most marine batteries. Due to vibration, the inner cells dislocate, resulting in deterioration of the battery. For this, nowadays, many marine battery manufacturing brands have designed batteries that are resistant to vibrations. The batteries that are vibration resistant last a lot longer than the standard ones. Along with marine battery, you can also buy some additional accessories necessary for your battery and boat. The best part of buying accessories along is that you’ll get those at reasonable rates and even at some discounts. You can include items like battery box, tray, marine battery chargers, boat battery isolator, and marine switches, extra terminals for your marine battery, and also some battery and electrical cleaners. There are countless accessories available. Choose them on the basis of your requirement. Marine batteries come with varieties of price tags. High cost doesn’t always make the unit durable and optimal. There are many such low end marine batteries that are equally powerful and even more durable. I would personally suggest you to go for the best battery that can be afforded in your budget. Almost all the marine battery brands provide some period of warranty to their products, in order to ensure the buyer that their investment is in safe hands. In fact, many marine batteries come with warranty time of 5 years and even more. Along with the other factors mentioned above, you must consider the warranty period as well. You can go through the reviews to learn more about the warranty provided by various marine battery brands. While buying a marine battery, the first and foremost factor that you must consider is the application of the battery. A marine battery is usually used for two applications, one for starting the boat or other engines and the other is to power up various appliances. According to the demand of usage, basically there are three types of marine batteries; cranking battery, deep cycle battery and dual purpose battery. Starting or cranking an engine needs more power and sudden outburst of power, so cranking batteries are specially designed and manufactured to meet the power need for cracking. A cranking battery has more number of lead plates that are thinner and with more surface area than that of the deep cycle battery. In cranking battery when the engine is running, the power is quickly replaced by the alternator. A cranking marine battery is only designed for cracking applications. In case you use the cranking battery as a deep cycle battery for powering up other appliances, the battery might heat up and it can cause permanent damage to the battery. Usually the appliances running on the battery require power at very slower rate but for an extended period of time and for running the various accessories the battery must be capable of deep cycling. For this reason, the deep cycle marine batteries have fewer lead plates but thicker than that of the cracking marine batteries. The deep cycle batteries are specially manufacture to bear deep cycling necessary to power up the appliances for long period. In case a deep cycle marine battery is used as a cranking battery to startup an engine, the battery might not be able to provide that much startup power and the engine may not run at all that can be problematic if you are stuck at the water. A dual purpose marine battery is a hybrid battery that has been designed and manufactured in a way that the battery can be used as both cranking and deep cycle. Though having a separate cranking battery and deep cycle battery must the first preference, but in case your boat is small and has room for installing only one battery then a dual purpose battery is the best idea. Using a dual purpose battery you can get both your cranking and powering task done with a single battery. Though a dual purpose marine battery is designed for both the applications but it might not be able to give the same cranking power as a true cranking battery and it might also not be able to withstand that much deep cycling. Flooded battery or the wet-cell battery is the traditional lead-acid battery. Each wet-cell consists of battery acid, which is the mixture of sulfuric acid and distilled water. The wet-cell batteries are the most popular batteries as these batteries are available at lesser price than other marine battery types and also the wet-cell batteries have numerous advantages. Flooded batteries are very less likely to be damaged due to overheating and overcharging unlike the gel or the AGM batteries. Premium wet-cell batteries are capable of as much as 1,000 deep cycles if the battery is maintained and charged appropriately. Wet-cell batteries are very less costly than other marine battery types and these batteries are capable of providing reliable service that can be compared to those high budget batteries. The flooded marine batteries have tremendous durability and these batteries can last very long if cared and maintained properly. One very important drawback of the flooded battery is that this type of battery is not capable of withstanding heavy vibrations like boat or other motored units. The interior of the wet-cell batteries are designed in an accessible manner, so these batteries require regular check and routinely filling of distilled water. As the flooded batteries emit hydrogen gas so a proper ventilation of the battery compartment is a must. With flooded batteries there is always high risk of spilling corrosive acid that can cause much damage. The self-discharge rate of the flooded battery is extremely high. Distill water will add up a lifetime expense as you will have to buy it for every refill. The gelled marine batteries are same as the flooded batteries as these are filled with liquid electrolyte; the feature that is different in the gelled batteries is that the electrolyte is gelled with silicates before the batteries are sealed. Gelled batteries are also somewhat same as the AGM marine batteries due to the recombinant technology that is used in manufacturing those batteries. The various advantageous features make this type of battery one of the most suitable marine batteries. Gelled marine batteries are sealed and maintenance free. With gelled battery, you won’t have to do any routine filling or regular inspection. These batteries are extremely tolerant to low temperature and they can withstand heavy shock and vibrations, which make these batteries good for boats or motored marine units. Gelled batteries can bear very high overcharging and unlike other types of marine batteries, the gelled batteries don’t get damaged easily. The internal self-discharge rate is less than 1 percent per month in most of the gelled batteries, so these batteries can be stored for very long period without being recharged. There is no risk of plate sulfating, which is the main reason for battery lives being shortened, so the gelled batteries are extremely durable and very reliable. There are some low quality gelled batteries in which the gel mixture is not done properly due to which some amount of the electrolyte doesn’t get mixed completely and remains as liquid. There is risk of this type of condition while buying a gelled battery as there is no way that you can check the interior ingredients. Gelled batteries have much more higher costs than that of other battery types with same ratings. Some gelled batteries are recommended to be charged at very low voltage, which doesn’t go with the regular marine battery chargers as they reach higher voltages; for recharging some gelled batteries, special gel battery charger is necessary. AGM marine batteries are also called the absorbed glass mate batteries. These batteries are totally different from those liquid electrolyte filled batteries as the AGM batteries are manufactured with a completely different type of technology. Instead of using liquid electrolyte, the glass mates are absorbed with electrolyte and the mates are placed between the lead plates. As the matting is saturated with electrolyte, it allows the oxygen to recombine with hydrogen gas and form water internally, which eliminates the need for any water refilling. There are many good features of AGM marine batteries that make this type of battery one of the most popular and reliable batteries. AGM marine batteries require the least maintenance as only some time-to-time external cleaning is required. No refilling of distilled water is necessary due to the recombinant technology. These batteries are extremely shock and vibration resistant. What makes the AGM battery a perfect marine battery is that the battery is submersible without being damaged. The self-discharge rate of the AGM marine battery is very low, which is around only 3 percent per month at 77° F.
With AGM marine batteries there is no risk of any liquid or gas spill as the recombinant technology takes care of the gas and the AGM batteries are completely sealed. As AGM batteries are not vulnerable to liquid spilling, those can be placed at any angle. Even if you have a space for battery at abnormal position, the AGM marine battery can be placed with no hassle. In case the AGM battery is accidentally overcharged, the water cannot be replaced, leading to complete battery replacement, which makes this the riskiest drawback of the AGM batteries. AGM batteries are a lot heavier than the wet-cell batteries, so for small boats, the AGM battery is not a very good idea. AGM marine batteries are also way costlier than the flooded marine batteries with the same ratings. Lithium marine batteries are the newest type of marine batteries available at the market. These batteries are different from those lead batteries as the lithium batteries have more different chemistry and technology. In these batteries, lithium metal is used as the anode. These batteries are lesser in weight than the AGM marine batteries or the wet-cell batteries. Lithium batteries are very safe and reliable and they have many such features that make this type of battery an ideal marine battery. With lithium batteries, you won’t have to worry about accidental overcharging as these batteries have the new technology of power control board that prevents the batteries from overcharging. This technology has proven to be very useful as no damage is done to the battery with any risk of overcharging. Lithium batteries have some automatic features that protect the batteries from low voltage, reverse polarity and short circuit. These batteries also have a feature that balances the charge on the batteries. Lithium batteries are completely maintenance free. Lithium battery offers high quality performance, deep discharge depth, reliability and safety. These marine batteries are environmental friendly and mostly known as the green alternative. Lithium batteries are many times more expensive that the AGM, flooded or the gel marine batteries and the price won’t match some of the buyers’ estimated budget. Just like in normal batteries it is CA rating, in a marine battery, the marine cranking amp rating is the amount of amperage produced at 32° F while starting the engine. In case you are buying a cracking marine battery, MCA is the most important rating that should be noticed. The MCA rating labeled on the battery indicates the starting power of the battery. You must check the type of engine that you have and the recommended MCA for it and according to the requirement the battery can be decided. Always purchase a battery with CA or MCA rating equal to or greater than the recommended value. In case you are purchasing a deep cycle marine battery, one of the most important factors that you must consider is the reserve capacity rating. RC rating is the amount of minutes the battery can discharge up to 10.5 volts by 25 amperage discharge at 80° F. The RC rating of the deep cycle battery indicates the duration of time it can carry a particular load before falling into dead zone. You should remember that the higher is the RC rating of the battery, the longer will it be able to power up your appliances. Cranking batteries also have RC ratings, but the ratings are many times lesser than that of deep cycle batteries and the deep cycle batteries are able to bear several deep discharges and recharge unlike the true cranking batteries. Mostly the high quality marine batteries have RC rating of 180 minutes and the low quality ones have around 35 minutes. The average quality batteries have RC ratings ranging from 60 to 90 minutes. Cold cranking amp rating of the marine battery is as important as that of marine cranking amp. Cold cranking amp is the amount of amperage the battery will provide for 30 seconds to maintain at least 7.2 volts at 0° F. The average CCA rating is 500, which keeps the battery to maintain up to 10 volts. The batteries with average CCA ratings of 300 to 500 allow the battery to fall up to 7.2 volts, which is the least power required to crank an engine. So in case you need a battery to start an engine during cold weather then you should consider buying a marine battery that has minimum of 500 CCA rating. Amp hour rating is the most important rating to consider while you are choosing a deep cycle battery. The standard rating is taken by 20 hours. For example if a battery has 100 AH, it will discharge 5 amps per hour for total 20 hours. If you need more power to run your appliances and for longer time then you should go for the marine battery with more amp hour. However one should remember that the battery with 100 AH is not necessary that the whole 100 amp will be discharged; so in case the appliances require total of 100 amps then one can select a battery that has 140 AH or 150 AH. While purchasing a marine battery, one important thing you must consider is the size of the battery and the space you have for installing the battery. 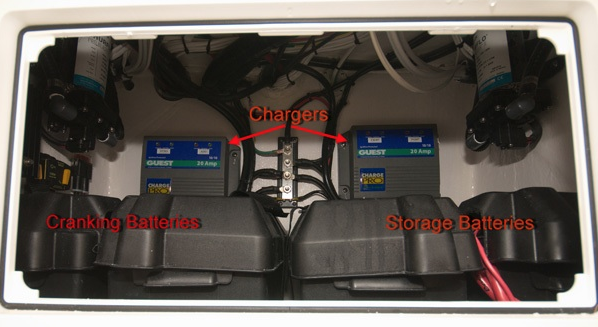 In case there is no enough space on your boat to install a battery of a particular size then it is no use going for that battery. The marine batteries of almost all the brands come in groups like 24, 27, 31, 34, 6D, 8D and so on with slight differences in the dimensions. First you should check the space you have for the battery and compare the dimensions and select the battery of the matching group. One should also keep in mind about the ventilation system. Weight is also an important factor. If you need to move around you battery, then it is no use buying a battery that has too much of weight. For marine field it is always recommended to go for an easily portable battery. There are situations when the compartment of the battery is not at horizontal position and it has been designed for slightly vertical position. Before buying the battery you must be sure about the position of your battery compartment as the wet-cell batteries are not recommended for any other complicated positions as there is risk of acid spilling; whereas gelled, lithium or AGM marine batteries can be placed virtually at any position except upside down as it might damage the internal elements of the battery. If the position is not horizontal then it’s better not to go for a flooded battery. Batteries come with volts; mostly batteries are available in 12 volts, 18 volts or 24 volts. If you buy 12 volts battery, you will have to buy multiple batteries as 12 volts battery is not capable of powering up singly. 18 volts batteries are good but the power might be too low. Most of the buyers prefer 24 volts batteries as these are powerful and reliable, especially if your boat or marine unit has very less room for batteries then 24 volts battery is an ideal choice. Some marine batteries like the flooded marine batteries require a lot of maintenance like routine inspection for acid spill, terminal corrosion check and timely refilling of distilled water. Many users might find these maintenance tasks very annoying and time consuming. Other marine batteries like the AGM, gel or lithium batteries require least maintenance as only external terminal check is necessary. So you must also consider the time you have for the maintenance. Varieties of batteries are available at wide range of budget. It is not always right that the batteries that are costly will last more. It is up to your maintenance and care that decides the durability of the battery. If you have an estimated budget on your mind, go for the best battery that can be afforded in your budget. Many low budget batteries are also as powerful and high quality as the high budget ones. Manufacturing date of the battery must also be considered while purchasing a marine battery. The battery’s labels also indicate the MFD date of the battery along with the ratings and in most of the batteries; the month is indicated by alphabets and the year by numbers. You should always prefer the fresh ones. All the marine batteries offer some warranty period and warranty is a must. Some batteries come with full-rated warranty period and some come with pro-rated. In full-rated warranty, the whole battery can be replaced for free if it fails before the warranty ends, whereas in pro-rated, you will only get some amount refunded for the unused period of warranty. Be very carefully while reviewing the warranty. This website has been created not because I run a battery business, but I am onto something more sensible. I am familiar with the disappointments that many buyers face after choosing a wrong marine battery. Whether it’s for business or for recreation, one wrong choice can ruin everything. Trust me; I have been through the same situation. This is the reason why I thought of doing some research by myself, only to realize that there are a lot of things I needed to know. Now that I have gained so much of knowledge about marine batteries, I decided to share my knowledge with other marine enthusiasts like you. After all, we learn more when we share the most. I really hope that my website will not only help you in selecting the right marine battery, but you’ll also get much more important information. Selecting a marine battery is no doubt a very tough task, but understanding all the types of batteries, their advantages and disadvantages can be very helpful in choosing a perfect battery that will suit your need. Going through the reviews of the various batteries gives you an idea about the top qualities and features, which allows you to compare between the best ones. Having the right battery will reduce many worries while you are out on a marine trip and let you enjoy or work with full concentration. Everything in my website is useful, honest and to the point. Hope you enjoy your time reading, and also find the right battery that best suits your need.